08:35 GMT - Shebab praise - Somalia's Shebab militants, Al-Qaeda's main affiliate in Africa, has praised the massacre. "They made millions of Muslims happy by taking action. Some misguided people claim that freedom of expression was attacked, but that is not the case, and the two heroic people acted accordingly," Radio Andalus, the official mouthpiece of the militants, said in a commentary. 08:31 GMT - Drama - The drama unfolded on the National 2 highway, with a police source saying the two suspects might be the brothers. 08:03 GMT - Schwarzenegger - Arnold Schwarzenegger has tweeted his support @Schwarzenegger: "I stand w/ the ppl of France against terror & I want to send a msg so I'm subscribing. You should too. " 07:51 GMT - Roadblocks - Police and soldiers are carefully controlling access to the area stopping and searching every vehicle, as the search resumes, particularly in the wooded areas between Villers-Cotterêts and Soissons, in the Picardy region. 07:26 GMT - Nervous night - For residents in the villages area it has been a nervous night, constantly in fear that one of the two brothers will make an appearance in their back gardens. Time after time, heavily armed police have searched garden sheds, garages and any other potential hiding place, guided by anxious residents. As the Sun set, the search operation took on a new sense of caution, as shadows lengthened. "I'm afraid, night is falling and they may be nearby," confides Roseline, a grandmother, living in the village of Villers-Cotterêts. "I've made the rounds of my house, closing the shutters, but there are plenty of nocks and crannies where they could hide," says Michel, a local bus driver. A young student, armed with a small camera and a laptop computer, says he wants to do his bit to help. "I know they are dangerous, but I don't care," he says with bravado. If nothing else he had the chance to film two motorists who had the misfortune to be driving a car similar to the one used by the two brothers. faced by heavily armed, and deeply suspicious police, they were forced to leave the car with arms held high for an identity check. 07:16 GMT - Numbers reduced - As the search goes on, the large number of elite police deployed in the Aisne region some 80 kilometres (50 miles) northeast of Paris -- some on horseback -- has been reduced overnight. 05:38 GMT - 'deeply affected' - French author Michel Houellebecq has suspended the promotion of his new novel "Submission", a vision of France under Islamic rule, his agent says. Houellebecq, whose book was released the day of the attack, was a friend of one of the victims, Bernard Maris, which has left him "deeply affected by the death", his agent Francois Samuelson tells AFP. He "left Paris to get away from it all, to the snow", Houellebecq's publisher Flammarion says. 04:27 GMT - 88,000 mobilised - Here is a brief summary of events as French Interior Minister Bernard Cazeneuve announces 88,000 security forces have been mobilised in the hunt for the two brothers and an international meeting on terrorism will take place in Paris on Sunday. Cazeneuve says nine people have been detained as part of the operation. In the Aisne region northeast of Paris, elite police and paramilitary forces search a wooded area near where the fugitives earlier robbed a petrol station and abandoned their car. The brothers are believed to possibly be on foot and still armed with at least a Kalashnikov. The head of Britain's MI5 warns Islamist militants are planning other "mass casualty attacks against the West" and intelligence services may be powerless to stop them. A senior US official tells AFP one of the two brothers was believed to have trained with Al-Qaeda in Yemen while another source says the pair have been on a US terror watch list "for years". US President Barack Obama signs a book of condolence with the message "Vive la France!" Bells tolled across France and people gathered outside the headquarters of Charlie Hebdo in pouring rain with banners reading "Je Suis Charlie" (I am Charlie). The same sign has featured in vigils around the world, from Australia to the United States. Several thousand people gathered later in Paris for a second night in tribute to those killed as the Eiffel Tower dimmed its lights. Television footage showed children at a Muslim school in the northern French city of Lille holding up sheets of paper emblazoned "not in my name". 01:21 GMT - Al-Qaeda trained - A US official tells AFP that according to French intelligence, one of the two brothers, Said Kouachi, trained with the Al-Qaeda affiliate in Yemen in 2011. Another US official tells AFP that brothers Cherif and Said Kouachi, had been on a US terror watch list "for years." 01:14 GMT - 'cannot stop everything' - "Although we and our partners try our utmost, we know that we cannot hope to stop everything," Parker adds. "We still face more complex and ambitious plots that follow the now sadly well-established approach of al-Qaeda and its imitators -- attempts to cause large-scale loss of life, often by attacking transport systems or iconic targets," he says. 00:53 GMT - 'mass casualty attacks' - The head of Britain's domestic spy agency MI5 warns that militant Islamists in Syria are planning "mass casualty attacks" in the West and that intelligence services may be powerless to stop them. 00:17 GMT - 'Vive la France!' - "On behalf of all Americans, I extend our deepest sympathy and solidarity to the people of France following the terrible terrorist attack in Paris," US President Obama wrote in a condolence message at the French embassy in Washington. "As allies across the centuries, we stand united with our French brothers to ensure that justice is done and our way of life is defended," he added, according to the White House. "We go forward together knowing that terror is no match for freedom and ideals we stand for -- ideals that light the world. Vive la France!" 23:43 GMT - Obama visits French embassy - US President Barack Obama visits the French embassy in Washington to sign a book of condolence and observe a minute of silence. French ambassador Gerard Araud tweets that Obama's gesture was "moving and highly significant". Other leaders, including German chancellor Angela Merkel and Romanian President Klaus Iohannis, also left messages of condolence today at French embassies around the world. 19:02 GMT - Eiffel Tower goes dark - The lights on the Eiffel Tower go out in Paris as France marks a national day of mourning for the 12 people killed in Wednesday's attack. 17:55 GMT - 'No link' - French Interior Minister Bernard Cazeneuve says there is no link "at this stage" between the attack at Charlie Hebdo and the shooting Thursday morning in Montrouge. In a televised press conference, he says the threat in France remains "very serious" as police continue the hunt for Wednesday's killers but warns: "We shall not tolerate any threat against a place of religion or hostile demonstration against the French people because of their origin or their religion." 17:44 GMT - Wounded - The four people most seriously injured in Wednesday's attack against Charlie Hebdo remain in a critical condition in hospital after being operated on overnight, medics say. Seven others wounded who were said to be in a stable condition have been discharged from hospital. 17:32 GMT - #JeSuisCharlie - The hashtag #JeSuisCharlie (I am Charlie), in tribute to the 12 people gunned down at Charlie Hebdo, has been used in more than 3.5 million tweets, according to Twitter. The trending slogan reached a peak at 2030 GMT on Wednesday, hours after the bloody assault, with some 6,500 tweets using the tag. 17:21 GMT - Army patrols - Pierre Elding, an Army sergeant patrolling near the Eiffel Tower says security forces are on heightened alert as crowds gather for a demonstration called by the mayor of Paris. "Paris is France's capital and so we have different cultures here," he says. "People from all over the world come to Paris, so we pay attention to everything, when people form groups for example. It can be small details, we watch everything around us. "There are eight of us in every group -- that allows us to watch pretty much everything in the vicinity. A mission is a mission but of course there is some extra tension... our vigilance is heightened." 17:09 GMT - Bloody scene - A Charlie Hebdo columnist who arrived at the scene of the attack three minutes after it happened has described the horrific scene that greeted him after his colleagues were shot dead. Patrick Pelloux would normally have been at the editorial meeting, but was attending a meeting elsewhere in Paris to improve links between emergency services. He tells AFP: "I was at this meeting when Jean Luc, the graphic artist (of Charlie Hebdo) called me to tell me: You have to come here quickly, they have shot at us with a Kalashnikov. "I thought it was a joke, but it wasn't. When I arrived it was dreadful," he says, choking with emotion, adding "I couldn't save them". "As we were taking care of the victims, they (the attackers), were still on the streets killing people." 16:55 GMT - Elite units - To give some context on the scale of the French search operation, the elite police unit Raid and military unit GIGN are deployed together in the region of Picardie for the first time in their history. They are operating in a 15-20 km zone around Crépy-en-Valois in the department of Oise. 16:42 GMT - IS radio - Islamic State group radio station Al-Bayan broadcasts a statement praising Charlie Hebdo killers as "heroes". It says: "Jihadist heroes have killed 12 journalists who worked for the French magazine Charlie Hebdo and wounded more than 10 others, to avenge the Prophet (Mohammed)." In fact, only eight journalists died in the Wednesday assault on the satirical magazine's Paris headquarters. Of the four others who died, two were policemen. 16:21 GMT - Search operation - In the locality of Corcy, in Villers-Cotterets, around 20 police from elite force Raid, masked and heavily armed, are surrounding a house, an AFP correspondent reports. Officers have entered the house to investigate and ordered the press to keep their distance. Similar scenes are being replicated in other villages and hamlets in the area, according to an AFPTV team near an abbey in the village of Longpont. Celebrating mass for the Charlie Hebdo victims earlier, he said: "The terror attack in Paris brings to mind so much cruelty, human cruelty, so much terrorism, both isolated terrorism and of state terrorism. "We pray for the victims of this cruelty, so many of them. And we pray also for the perpetrators of such cruelty, that the Lord might change their hearts." 15:58 GMT - MI5 pledges support - In rare public comments, MI5 Director General Andrew Parker says the attack was a "terrible reminder" of the threat facing Western nations. He confirmed the agency was offering its French colleagues their "full support as they respond". "It is too early for us to come to judgments about the precise details or origin of the attack but it is a terrible reminder of the intentions of those who wish us harm," said Parker. 15:55 GMT - Britain on alert - Britain has stepped up security at ports serving France as the MI5 intelligence agency offered French counterparts its "full support". The terror threat level remains at "severe" and officials say the measures were precautionary following the Charlie Hebdo attack. 15:47 GMT - Security alert - France has extended the highest security alert level already in place in greater Paris to the northern Picardy region where police have zoned in on two suspects in the magazine massacre. "The prime minister has decided to extend the attack alert level to Picardy," Prime Minister Manuel Valls' office says, after two brothers sought for the attack were spotted in the region, resulting in a massive deployment of security forces. 15:42 GMT - Global protests - AFPTV footage shows tributes and demonstrations of solidarity around the world, including Russia, China, Turkey, Hong Kong, Germany, Belgium and Poland. Zia, a French resident in Istanbul, says: "Despite the fact that I'm Muslim and that I am against their cartoons, it doesn't mean what happened should have happened; that's why I'm here." Aise, a retiree from Edirne, says: "As a Muslim, I'm standing firmly against these events that have nothing to do with Islam; as I said, no religion can justify the loss of human lives." 15:28 GMT - Paris mayor - French daily Liberation quotes the Paris mayor as saying: "Their weapon was a pencil.... It is the most peaceful form of criticism that they want to silence. It is our duty to remain standing, for them, and to shout out that their attackers will not win." 15:24 GMT - Sweden tribute - Swedish tabloid Expressen carried 14 of Charlie Hebdo’s cartoons on Thursday and published a hand-drawn front page while Dagens Nyheter republished French cartoonist Martin Vidberg’s tribute to Charlie Hebdo that originally appeared in Le Monde. "Today, I draw for Charlie Hebdo," it reads. 15:19 GMT - Eiffel Tower switch-off - The mayor of Paris Anne Hidalgo is calling another peaceful demonstration at 18:00 at the capital's Place de la Republique in hommage to the massacre victims. As a sign of mourning, the lights of the Eiffel Tower will be switched off at 20:00. 15:10 GMT - Military reinforcements - In emergency measures put in place after the attacks, under France's Vigipirate security alert plan, 350 soldiers have been deployed across France. The army's general staff signalled that 250 more could be made available after the first reinforcements arrived overnight in Douai, Agen and Frejus. 14:55 GMT - Denmark tribute - In Denmark the Charlie Hebdo cartoons appeared either as illustrations or in news photographs from France in a number of publications. Ekstra Bladet put Charlie Hebdo on the masthead in honour of the French weekly. Jyllands-Posten, the conservative daily that published the Mohammed cartoons in 2005, was the only major paper not to carry any pictures from Charlie Hebdo. 14:46 GMT - 'Turning point' - The cartoonist for "Salzburger Nachrichten", Thomas Wizany, penned a handwritten tribute to the Charlie Hebdo staff on the front page, praising their courage. "As a cartoonist, I thought until now there was no issue that couldn't be caricatured. After the tragic incident in Paris yesterday, I must admit I was wrong." Well-known cartoonist Gerhard Haderer told the Austria Press Agency: "This is a turning point for us all." But he insisted: "We will not be intimidated. We are now called upon to be smart and stand confidently against this." 14:35 GMT - Cartoonists react - The left-leaning Haaretz newspaper in Israel features a column on its front page by cartoonist Amos Biderman under the headline: "I'm Afraid". "The bad guys have won… they’ve beaten us big time in the battle for freedom of expression," he says. "All of Europe is shaking and so is America. Now there is no cartoonist or publisher who would dare start up with them," he adds. "They're all trembling in fear. Personally, I’ve felt threatened ever since the storm over the Danish cartoons depicting Mohammed in 2005. I don't go near the subject." 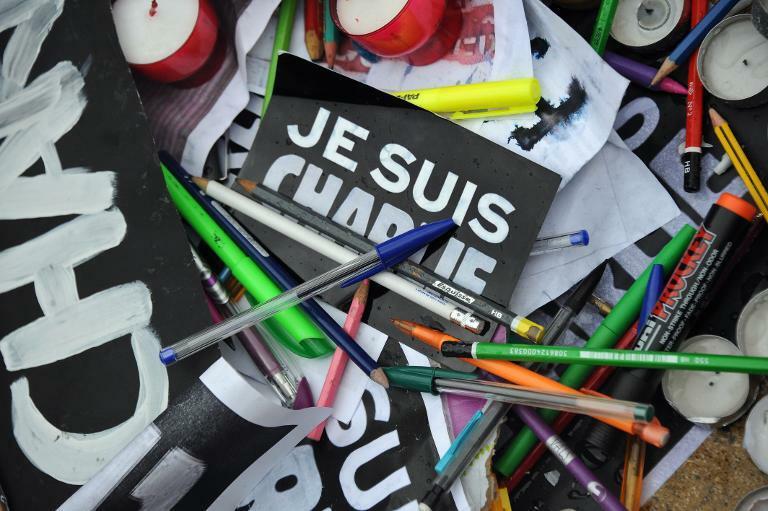 "The journalists at Charlie Hebdo... are few and far between, and truly courageous. I’d been following their editions, and I knew it would end badly." 14:32 GMT - Loving tribute - AFP's Isabel Malsang, at the Place de la Republique, in Paris, says tributes have been laid at the foot of the statue there in the form of pens and pencils shaped in a heart. Under the offerings is a list of names of the Charlie Hebdo cartoonists and writers killed in Wednesday's bloodbath. 14:25 GMT - Cairo condemnation - A leading Muslim group in Egypt has joined others worldwide in distancing itself from the attacks in Paris. Mohi Al-din Afifi, Secretary General of the Cairo-based Al-Azhar Islamic Research Complex, says the acts have "nothing to do with Islam". "As Muslims, as al-Azhar scholars and as the respected and international institute of Al-Azhar, we distance ourselves from these criminal acts, and we reject these criminal acts because we recognise the right for all people to live in a peaceful world", he says. "These acts have nothing to do with Islam, and nothing to do with the reality of the Islamic religion we believe in. We declare our solidarity and sadness with the victims of this criminal act." 14:12 GMT - Terrorist case - The shooting that killed a Paris policewoman on Thursday is being handled by anti-terrorist judges, the prosecutor's office has announced. It said the decision was taken "in view of the current context" but stressed that no link has yet been made between the two incidents. 14:08 GMT - Britons 'sickened' - British Interior Minister Theresa May says the "cowardly attacks" Thursday have "shocked and sickened people" in Britain and worldwide and are "a reminder of the very serious threat we face from terrorism". "In deliberately targeting and murdering journalists, the terrorists were attacking freedom and democracy. And in murdering police officers, they attacked the people who risk their own safety every day to protect us and our way of life," she says. 13:57 GMT - Police tribute - Philippe Brinsolaro, brother of one of the police officers killed in the Charlie Hebdo assault, says "the whole of France is mobilising against this". "We cannot accept the infringement of freedom of speech and liberty of expression. My thoughts are, of course with my brother, but also with his colleague who died," he says. "There is a feeling that the police are sometimes misunderstood by citizens but it should not be forgotten that the attack yesterday shows that, in any case, a policeman will always intervene when it comes to protecting our nation and today I want to pay tribute to all my colleagues... who face a difficult job." 13:49 GMT - Montrouge shooting - Hassan Tlili, a baker, in Montrouge, scene of the latest shooting just outside Paris, tells AFPTV: "Around 7am a woman came to the bakery with her child saying there's been shooting. She left her child with me and she went out. "A man started running saying that there were shots outside. He told me to lock the door, and I did. Five minutes later I opened up, I saw a women lying on the ground. Twenty minutes later firemen and police arrived." 13:47 GMT - Molotov cocktails - French investigators found a dozen Molotov cocktails and two jihadist flags in the getaway car used in the Charlie Hebdo massacre, a source close to the case tells AFP. "This shows their Islamist radicalisation and that they had possibly planned other acts with the petrol bombs," the source says. The items were found in the abandoned black Citroen used by the attackers to speed away from the offices of the Charlie Hebdo weekly after they gunned down 12 people. 13:33 GMT - Call for vigilance - Similar scenes of people gathering to pay tribute to the Charlie Hebdo victims are being seen across France, including in the southern port city of Bordeaux. Alain Juppe, mayor of Bordeaux, declares: "We will win this fight". "We've been touched to our very core, it's what we find most precious. This is why we fought for centuries, for our freedom," he tells crowds gathered for a minute's silence. But he urges vigilance, adding: "It's a form of war in this country, because we can see that the threat of terrorism is everywhere, it's very difficult to detect. "There's been a strong mobilisation of all our intelligence services, the police and the courts but no system can prevent an attack 100 percent. So a heightened vigilance is needed, the vigilance of all our citizens." 13:25 GMT - Round-up - For those of you just joining us, here's a brief summary of today's events so far as police search for the killers of Wednesday's gun attack on satirical magazine Charlie Hebdo which left 12 dead. -- Security forces are desperately hunting two suspects, named as Cherif Kouachi, 32, a known jihadist convicted in 2008 for involvement in a network sending fighters to Iraq, and his 34-year-old brother Said. -- Special operations forces have deployed in a northern town where the two brothers are believed to be located, a police source says. Seven people were detained earlier, said to be men and women close to the suspects. -- In a separate shooting early Thursday a gunman shot dead a policewoman and wounded a city employee with an automatic rifle south of Paris. There was also an explosion at a kebab shop in eastern France, with no casualties reported. Both attackers fled. -- Thousands of people across France observed a minute's silence after Hollande declared a day of national mourning, with flags flying at half-mast, after the country's bloodiest attack in half a century. 13:21 GMT - Circulation boost - A million copies of next week's Charlie Hebdo will be printed, according to a lawyer for the newspaper. Normally it has a print run of 60,000. 13:19 GMT - Special forces - French special operations forces have deployed in a northern town where the two brothers suspected over the Charlie Hebdo attack are believed to be located, a police source says. RAID, the anti-terrorist unit of the French police force, and the GIGN, a paramilitary special operations unit, are deployed in Villers-Cotterets in the northern Aisne region "where a car was abandoned after being used by the two suspects, who were identified by a witness," the source tells AFP. 12:52 GMT - 'Mosques targeted' - Bernard Perrut, mayor of Villefranche sur Saone, where the kebab shop blast happened near a mosque, says: "The coincidence of this morning's attack, the response, in a place close to a place of worship, may perhaps be a reaction. I hope that is not the case. I totally condemn it and call on the residents of this town to unite, in respect and in defence of the values of our country." 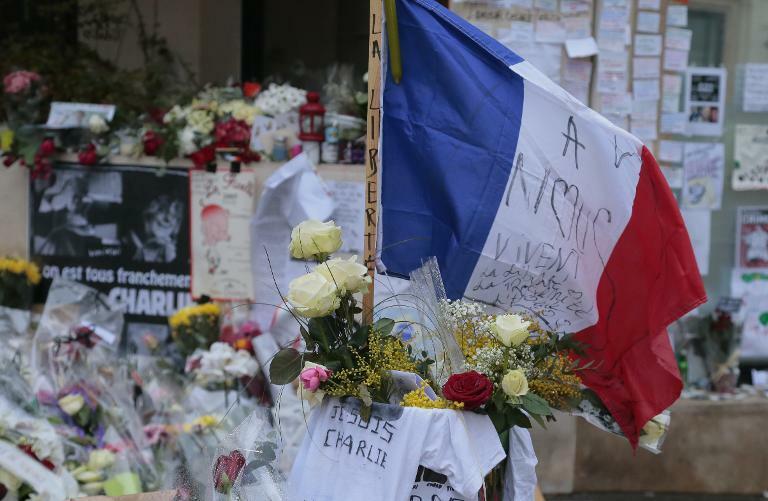 Abdellah Azzi, resident of Villefranche-sur-Saone, tells AFPTV: "It's very, very worrying. The day after an attack in Paris, we start to see mosques being targeted. It's becoming very serious. We really need to ask questions today." 12:49 GMT - Kebab explosion - More details are emerging about the explosion at a kebab shop in eastern France earlier Thursday. Gregoire Dulin, prosecutor of Villefranche sur Saone, says: "An explosive device was put in front of the door of the Imperial snack restaurant, located a few metres from the entrance to the mosque 'La Quarantaine' in Villefranche-Sur-Saône. "The restaurant was closed from 21:30. There is only material damage. The front of the shop was blown by the explosion of the homemade bomb." He added that police are "exploring all avenues" to secure the arrest of the attackers. There were no casualties reported. 12:33 GMT - Media scrum - AFP's Isabel Malsang is in Place de la Republique where tens of thousands of people rallied Wednesday night in central Paris. She says the square has now become a huge recording studio for radio and TV broadcasters who have arrived from around the world. The BBC's Paris correspondent Lyse Doucet ends her piece by saying that France from now on will likely have "a before-Charlie and an after-Charlie". 12:31 GMT - Attack on democracy - Nathalie, a Swiss woman passing through Paris, says: "I think it's nice that these people are coming. People are deserting faith, churches are empty... it takes something like this to bring them back. "Attacking the press is attacking democracy, the bedrock of French society," she says, adding that she had met Bernard Maris, a journalist and economist killed in the attack, nine months ago. "When you attack the press, you attack freedom. It is an old tradition, mocking power, this is after all the country of Voltaire, of Zola... fighting for liberty, freedom of expression, for the separation of the state and the church." 12:19 GMT - 'Religious fanatics' - Outside Paris's Notre Dame cathedral, people coming out of mass explain why it was important for them to turn out today. Philippe tells AFP: "I came out of solidarity -- it was a way of expressing my emotion and my thoughts for the families. "What happened yesterday will bring us together because the vast majority of Muslims do not share the ideas of these religious fanatics." 12:11 GMT - Police search - Thousands of police continue to scour France for the two brothers suspected of the Charlie Hebdo killings, reportedly sighted near Villers-Cotteret in the northern Aisne region of France. Interior Minister Bernard Cazeneuve earlier said seven people had been detained in the hunt for the gunmen, while a judicial source said the men and women held were people close to the suspects. 12:03 GMT - Suspects held - Authorities are questioning several people after making a number of arrests overnight, the prime minister said earlier. Police have released arrest warrants for and photos of brothers Cherif and Said Kouachi, both born in Paris, warning that they are likely to be "armed and dangerous." 11:55 GMT - PM warning - French Prime Minister Manuel Valls, also speaking outside the Elysee, warns against publishing information that might undermine the work of security forces seeking to trace the killers. "We want to inform French people of our mobilisation and also welcome the rallies held by our fellow citizens yesterday and again today, and certainly again at the weekend, and this willingness to fight for our democracy, for our tolerance," he says. "I also call on everybody to be responsible. Today, last night, this morning there is information circulating on the web but also in your broadcasts that could, let me repeat this, undermine the work of the security forces." 11:50 GMT - Sarkozy at Elysee - Former French president Nicolas Sarkozy has been at the Elysee presidential palace for talks with President Francois Hollande on the response to the attacks. He tells journalists: "Following the tragedy that France has just gone through, President Francois Hollande asked me to come here, to discuss the situation with him. Of course, I accepted this invitation to demonstrate the climate of national unity which is everybody's duty in the face of the attack undertaken by determined fanatics." 11:43 GMT - 'Difficult days' - As people lay flowers and candles close to the Charlie Hebdo offices, Anne, a Parisian woman, tells AFPTV: "Today I'm thinking a lot of the families of the 12 people who were murdered for their freedom to think freely, and I also feel deeply for the whole Arab and Muslim community living here in France because I think these are difficult days and we must stick together. "I think it was carried out by extremists, I think also that there are more of us, the pacifists, and we must go out in the street and say this loud and clear." 11:37 GMT - Notre Dame - Despite heavy rain hundreds of people have gathered on the square outside Notre Dame cathedral to pay tribute to the attack victims. In front of dozens of journalists and TV cameras from around the world, tourists file in to attend mass to pay their respects. AFP's Marie Giffard, in the square, says: "A few minutes before midday the silence of the assembled crowd was broken suddenly by a woman shouting "Charlie will be free!" As the bells began to ring, several people held pens in the air while others held up 'Je suis Charlie placards'. Many simply stood crying or with their eyes closed." 11:25 GMT - Hebdo 'suffering' - Charlie Hebdo columnist Patrick Pelloux says the remaining staff will soon meet, as he announced the next edition would go ahead. Speaking of their ordeal, he said: "It's very hard. We are all suffering, with grief, with fear, but we will do it anyway because stupidity will not win. He added that the publication would have to be put together outside Charlie Hebdo's headquarters which were not accessible following the massacre. Twelve people, including five cartoonists, were killed in Wednesday's attack. 11:19 GMT - Silent tribute - People across France observed a minute of silence earlier, broken only by church bells. Crowds of people stood silently in public squares, schools and outside official buildings. Bells tolled at Paris's Notre Dame cathedral and in churches across the country. Around 100 French lawmakers and senior officials at the National Assembly joined the tribute to the 12 people killed in Wednesday's attack, despite the French parliament being closed this week. They followed their silence with a rendition of La Marseillaise, the French national anthem. 11:08 GMT - Charlie Hebdo - Charlie Hebdo, the French satirical newspaper whose staff were gunned down in the attack by two gunmen Wednesday, will come out as scheduled next week, one of its surviving editorial members tells AFP. The publication, next Wednesday, is to defiantly show that "stupidity will not win," says Patrick Pelloux, adding that the remaining staff will soon meet. 11:02 GMT - Brothers 'located' - Two brothers suspected of the Charlie Hebdo killings were spotted Thursday morning and are armed, sources close to the manhunt say. The manager of a petrol station near Villers-Cotteret in the northern Aisne region of France "recognised the two men suspected of having participated in the attack against Charlie Hebdo", the source said. 10:56 GMT - Muslim appeal - France's main Islamic groups are urging Muslims across the country to observe a minute of silence and for imams to condemn terrorism in the wake of the massacre. The groups called on "Muslim citizens of France to observe a minute of silence today at midday (1100 GMT), along with the rest of the nation, in memory of the victims of terrorism." The appeal -- issued by Muslim assemblies from across France -- also called on imams at Friday prayers to "condemn the violence and the terrorism with maximum firmness." Muslim citizens were also asked to join "in massive numbers" a national day of solidarity on Sunday where demonstrators are expected to take to the streets of towns across France. 10:18 GMT - Mosque attacks - In separate incidents, Muslim places of worship in two French towns were fired upon overnight, leaving no casualties, prosecutors say. Three blank grenades were thrown at a mosque shortly after midnight in the city of Le Mans, west of Paris, and shots were fired in the direction of a Muslim prayer hall shortly after evening prayers in the Port-la-Nouvelle district near Narbonne in southern France. An explosion at a kebab shop near a mosque in the eastern French town of Villefranche-sur-Saone on Thursday morning also left no casualties. 10:16 GMT - Policewoman dead - Update on the victims of the latest shootings: a policewoman who was shot by a gunman wearing a bulletproof vest just outside Paris has died and a second victim is in serious condition, police say. Officers are hunting the attacker who escaped following the shootings. 10:12 GMT - Eyewitness - Near the scene of the latest shooting, police have blocked off Avenue Pierr-Brossolette, with journalists held back behind a security cordon, AFP's Juliette Montesse tells us. Local resident Ahmed Sassi, 38, describes a "scene of panic" in what is usually a "peaceful, calm" neighbourhood. He says he was woken just before 8:00 am local time by "two detonations". From his kitchen window he recounts seeing "a police officer standing, then another man in dark clothing who was running shot him down and continued to run. "I saw the police officer who was on the ground and his colleague who called for help. The attacker was difficult to see as it was still dark and he wore dark clothing." 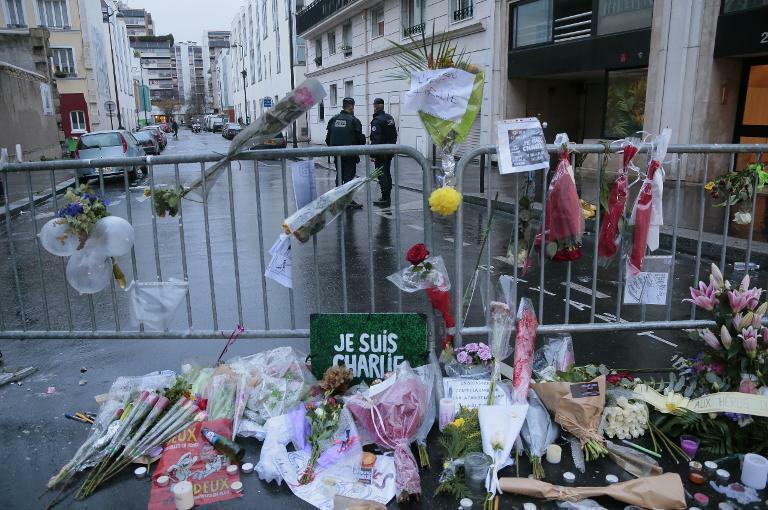 09:56 GMT - Floral tributes - Floral tributes have been laid near the site of the Charlie Hebdo attack in central Paris. One mourner, Francoise, tells AFPTV: "We must show that this is unacceptable, this should not be allowed to happen, it's not possible, so that means we must be here. This is important because I see this as an attack on free expression. These people were extraordinary, humane people. So there are plenty of reasons why it is important to be here today." 09:51 GMT - Day of mourning - France has declared Thursday a day of mourning as it comes to terms with the country's bloodiest attack in half a century. Tens of thousands of people took to the streets late Wednesday to express their outrage at the attack, while poignant demonstrations of solidarity were seen around world, from Moscow to Washington. Many held banners saying "I am Charlie" in support of press freedom. The controversial Charlie Hebdo magazine has repeatedly lampooned the Prophet Mohammed. 09:42 GMT - Second shooting - The gunman in the latest shooting is still on the run, according to French Interior Minister Bernard Cazeneuve -- who rushed to the scene at Montrouge, south of Paris -- earlier. This contradicts information given earlier by a source close to the case, who said the suspect had been detained. Police initially said the two victims were critical, but Cazeneuve says just the policewoman is fighting for her life. 09:36 GMT - Police hunt brothers - French security forces are desperately hunting two brothers suspected of launching Wednesday's attack on the central Paris offices of Charlie Hebdo, which sparked huge spontaneous demonstrations across France. Police issued have arrest warrants for Cherif Kouachi, 32, a known jihadist convicted in 2008 for involvement in a network sending fighters to Iraq, and his 34-year-old brother Said. Both were born in Paris. There has so far been no claim of responsibility for the attack. 09:23 GMT - WELCOME TO AFP'S LIVE REPORT on the hunt for the armed killers who carried out a deadly attack on French satirical newspaper Charlie Hebdo in Paris on Wednesday which left 12 people dead. In a separate attack early Thursday a policewoman and a municipal employee were seriously hurt after a man opened fire with an automatic rifle on the southern edge of Paris, police said. No link has yet been established between the two attacks.